ClickSend Help Docs - How does the opt-out system work? All Categories ​>​ Quick Start Guides ​>​ How does the opt-out system work? If you're using our SMS Campaigns system or Email Marketing platform, we have an opt out/unsubscribe system that you can use. It's ok to bypass the opt out system for some campaigns if they're not deemed as marketing related: Is Opt Out Required? Each email will have an 'Unsubscribe' link at the bottom of the email. When a recipient clicks this, it will move their contact to the 'Opt-Out List' contact list. Select 'contacts' on the left menu, then select the list you want by clicking 'view'. Select 'remove opted-out contacts' and follow the steps. Any previously opted-out contacts will be removed from this list. 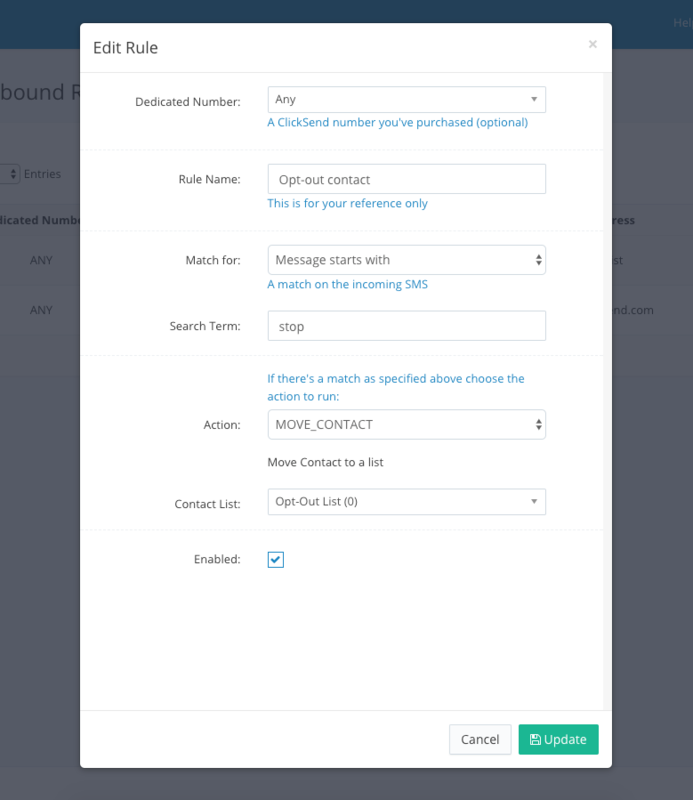 If you import a new contact list and have previously opted out contacts, it's important to click the 'Remove opted-out contacts' button on that new list after you've imported the contacts. This will remove all opted-out contacts from this list. Can I import previously opted-out contacts into your system? Yes. You can import or manually add opted-out contacts into the 'Opt-Out List'. Simply click on the 'Import Contacts' button or just '+ Add new contact'. How do I re-add the opt-out rule? If you have accidentally deleted the opt-out rule, you can easily re-add it. Select 'sms' on the left menu, then select 'settings' and 'inbound sms settings'. It's not possible to remove the Unsubscribe link.